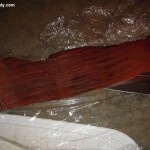 So a little bit of back story on this project. 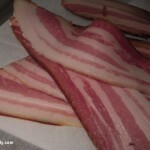 Around mid-March I ended up being part of a syndicate that was going to purchase a whole pig from The Slagel Family Farm down in central Illinois. 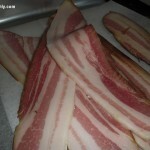 Well something went sideways in the order, and instead of a whole pig (~200lbs, dressed) being delivered to Mado they delivered half a pig (~100lbs, dressed) instead. 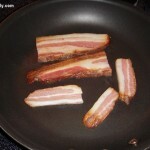 It was kind of a bummer to get half a pig, since we were splitting this pig four ways. 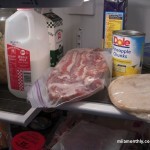 But in the end, half a pig worked out better, since we were struggling just to refrigerate half a pig. 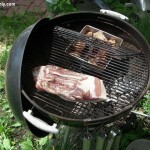 So I don’t even know where we would have stored another 100lbs of pork meat and bones. 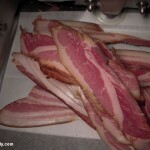 Anyways, after the pig was butchered down to primal cuts we ended up with about 4 or 5 pieces of raw pork belly. 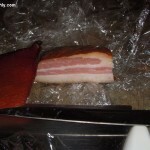 As a side note, when we were butchering the pig, we opted not to cut out baby back or spare rib racks out of the pig carcass. 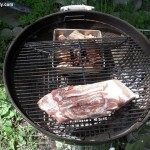 Instead we de-boned the rib cage meat so that we could get more “belly” out of the pig. 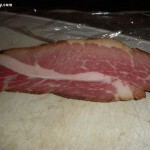 So with our slabs of un-cured belly meat, it was time to start the curing process. 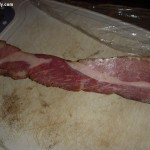 We ended up using a pretty simple cure of just three ingredients: maple syrup, kosher salt, and pink salt (also called DC Curing Salt, or Prague Powder # 1, or Insta-Cure, or Modern Cure). 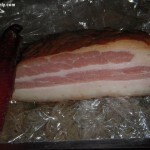 And basically after the un-cured pork was rubbed with all three ingredients, it was placed in a Ziploc bag to let the salt, pink salt and maple syrup do it’s curing magic to the bellies. 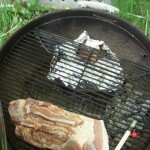 OK, enough of that little back story, here was how I ended up smoking the bacon. 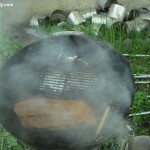 I’ve been collecting miscellaneous smoker parts for at least a year, and from what I’ve been able to cobble together over that time I was able to assemble a smoker. 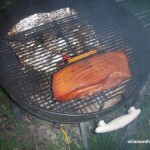 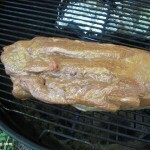 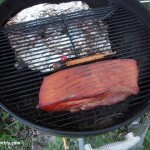 The main components of the smoker were my black Weber Kettle grill, an electric hot plate, a small cast iron skillet, a couple of handful of Hickory wood chunks and a piece of aluminum foil. 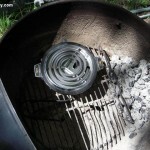 Basically where you would normally place the hot charcoal in the Weber for grilling, I placed the hot plate, and I routed the electrical plug from the hot plate through the ash vent at the bottom of the Weber. 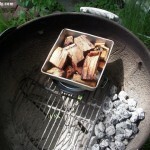 4:10pm CST about half the wood had burned off and the temp was 150F inside the grill. 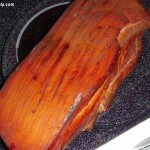 Turned the hot plate dial down to #4 from #7 and added some more wood to the foil packet. 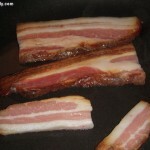 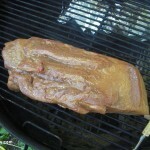 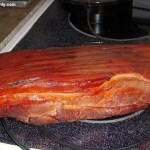 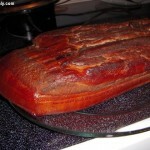 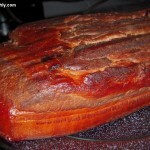 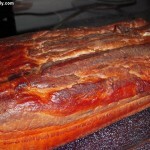 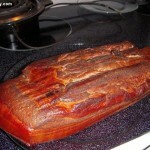 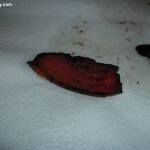 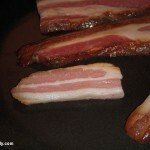 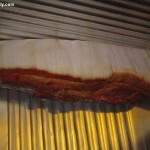 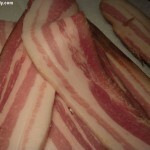 On 5/6/2010 I weighted the bacon slab and it came in at 2lbs 13.3 ounces. 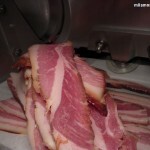 I then sliced it on my deli slicer into four 1/2lb packets, with a bunch of scraps left over for eating. 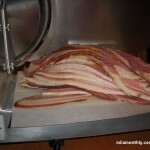 It worked out to about five to six slices per 1/2lb packet. 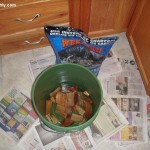 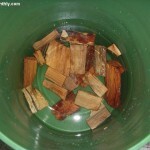 1) Soak the wood chips/chunks in water for as long as possible, preferably overnight. 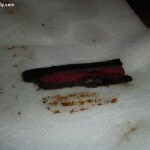 Since the wood that I soaked for under an hour ended up burning on the hot plate instead of smoking. 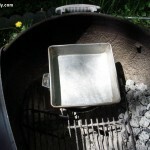 2) For this set-up, I needed to check the hot plate about every hour, since most of the wood that I used hadn’t been soaked for long enough so it didn’t smoke as much as it could. 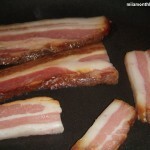 3) I finally cooking up a couple of slices of this bacon, and unfortunately I let it cure for too long, and it ended up turning into salt pork instead of bacon. 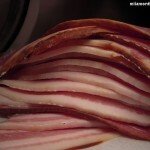 After a quick flip through Ruhlman’s Charcuterie book, I learned that you only need to cure bacon for about 6 days (basically until it is firm to the touch), while salt pork is cured for at least three weeks. 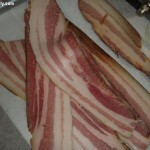 Keep in mind this is still the best salt pork that I’ve ever tasted, and at least I’ll now how some available for all my recipes, for instance clam chowder, coq au vin, split pea soup, shrimp and grits, boston baked beans, etc. 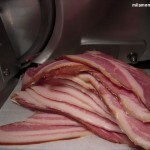 But no bacon for me, from this batch of pork.